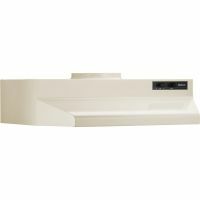 The range hood is designed for 7 inch round vertical duct attachment. The hood features a fan designed for years of trouble free service, an easy to clean grease filter, a protective lamp lens that distributes light evenly over the cook-top and control switches for fan speed and light activation. Includes built-in 7 inch duct adapter. Ducted: In this type of outlet the fumes or heat catched by the chimney are thrown out of the kitchen. Ductless In ductless outlets the fumes or smoke absorbed by the chimney is filtered and recycled back in the room. The hood or canopy size depends on the size of the kitchen. Normally a 2 to 4 burner stove/ hob requires a 2 ft chimney whereas a 3 to 5 burner require a 3 ft one. But to absorb maximum fumes or smoke, a chimney should cover the entire gas stove otherwise the heat, smoke or fumes will move out of the canopy area and cannot solve the desired purpose of a chimney. Charcoal or Carbon Filter: These filters are mainly used in re-cycling type of chimneys. They filter out the smoke and absorbs bad odour before it gets recycled back into the room. Mesh/ Cassette Filter: There are various layers of mesh that helps in throwing out the smoke and oil particles. Cassette filter is lightweight hence detaching this filter from chimney is very easy. To Recieve updates and possible rewards for Broan USA 423602 please sign in. To Recieve updates and possible rewards for Chimney & Hood please sign in.